European Union leaders today reached a deal to contain the euro-zone debt crisis by agreeing on a comprehensive package of measures, including a 50 per cent write down of Greece’s debts. Euro zone leaders are as far as ever from finding a lasting solution to the bloc’s underlying problem of economic divergence, despite their latest progress in managing the symptoms of its debt crisis. Sony Corp is to take over the Sony Ericsson mobile phone joint venture for 1.05 billion euros ($1.45 billion), as it seeks to catch up with smartphone and tablet makers Apple and Samsung. Credit rating company Moody's Corp beat analysts' estimates even as profit fell on a drop in corporate bond issues amid government debt crises in Europe. Net income fell to $130.7 million in the third quarter from $136 million a year earlier, the company said on Thursday. The US economic growth increased at its fastest in a year in the third quarter as consumers and businesses set aside fears about the recovery and stepped up spending, creating momentum that could carry into the final three months of the year. Michael Douglas portraying hot shot trader, Gordon Gekko immortalised the punch line “Greed is good” in the Hollywood epic, Wall Street. Apparently, greed or bad judgement may have caused the downfall of the iconic Indian-American corporate honcho, Rajat Gupta. Domestic demand is helping the Indian economy, but signs from Europe’s debt crisis and a faltering US recovery are worrying, industry chamber Assocham said today. Food inflation shot up to 11.43 per cent for the week ended October 15 on the back of costlier vegetables, fruits, milk and protein-based items. India's richest are losing wealth due to inflation and corruption scandals, according to Forbes magazine, which says that the combined wealth of the country's 100 wealthiest is down 20 per cent from a year ago. The government today said it has sanctioned setting up 21 of integrated textile industrial parks with world class infrastructure in nine states involving a total development cost of Rs 2,100 crore. The Delhi High Court has dismissed Bharti Airtel's plea against telecom tribunal TDSAT that asked it to first pay half the Rs 50 crore fine imposed on it by DoT before the hearing. This will reduce debt repayment obligations of Greece to around 100 billion euros. A plan was also put in place to boost the firepower of the group’s bailout fund, the European Financial Stability Facility (EFSF). The heads of state and government of the EU, who held their second emergency summit in Brussels in two days, also agreed to strengthen the capital structure of Europe’s large banks to shield them from the effects of the debt write-off or future government defaults. Their meeting, which began last afternoon, continued till the early hours of this morning. The agreement by banks and insurance companies was hammered out after several weeks of tough negotiations. Until now, banks and insurances vehemently opposed any debt cuts beyond a 21 per cent voluntary reduction agreed as part of the second bailout package of 109 billion euros for Greece, unveiled by the euro zone leaders three months ago. 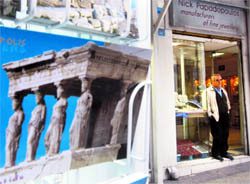 Differences between the 17 euro zone nations and representatives of banks and insurances over the level of the debt write down for Greece had come to a head when the euro group pressed for a 50 per cent cut during parallel negotiations in Brussels, and threatened to put the entire process in disarray. The breakthrough apparently came after German Chancellor Angela Merkel, French President Nicolas Sarkozy and Luxembourg Prime Minister Jean-Claude Juncker intervened, media reports said. Much deeper cuts than the 21 per cent reduction planned in July became necessary after the latest report of the "Troika" inspectors of the European Commission, the international Monetary Fund (IMF) and the European Central Bank (ECB). They had warned that Greece’s debt of 170 per cent of the GDP in 2012 will be the highest in Europe and must be brought down to avert the risk of a contagion in the euro area. The "Troika" estimated that Greece will have a financing gap of 252 billion euros in 2020, nearly 150 billion euros more than the estimates in July. It recommended scaling down its debt burden to 110 per cent of the GDP by 2020. The complex agreement reached in Brussels in the early hours of Thursday lends credence to the view that the euro zone will somehow muddle through. But it is not the Grand Plan that optimists had hoped for: what was the 14th summit in less than two years to tackle the crisis will not be the last. European equities and the euro rallied after the summit exceeded markets’ modest expectations. Banks agreed in principle to a 50 per cent reduction in the face value of their Greek bonds and leaders said they intended to increase the firepower of their financial rescue fund to 1 trillion euros ($1.4 trillion). But nearly 35 per cent of Greek bonds is in the hands of public institutions such as the European Central Bank (ECB) and is not subject to the mooted writedown. As a result, Greece’s debt would still be an eye-watering 120 per cent of gross domestic product in 2020, exactly the level of late 2009. And even that assumes decent economic growth and ambitious structural reforms including large-scale privatisation of state assets. “From the macroeconomic point of view, if it’s purely a 50 per cent ‘haircut’ on the nominal bonds, without an extension of the maturity and a reduction of the coupon, I’d still be reasonably suspicious about the sustainability of Greek debt,” Deo said. Greece, however, has become something of a sideshow. Investors long ago judged that it was not just illiquid, but insolvent. Much more critical is what the euro zone could do to prevent the debt rot from spreading to bigger, systemically important but stagnant economies, notably Italy. Markets will have to wait for details as to how the European Financial Stability Facility (EFSF) will be scaled up; whether the likes of China will top up the bailout fund; and how operationally it will enhance the credit of member states’ new bonds. But some analysts are sceptical. Economists at the Royal Bank of Scotland (RBS) said they expected markets to re-price sovereign debt across the Euro area given the size of the losses imposed on Greece. Expressed as the “net present value” of the bonds, the proposed loss will be close to 70 per cent, much more than the 40 per cent hit that banks had volunteered to take, the RBS said. What’s more, the EFSF will be too small to offer help to any country that might need it for any length of time. And a promise by governments to help banks regain access to long-term bond market funding implies they will have to assume extra contingent liabilities, thus adding to their debt burdens. Yet another source of doubt involves the European Central Bank. Economists interpreted comments made on Wednesday by Mario Draghi, who takes over the helm of the ECB on November 1, as indicating that the bank will continue to buy Spanish and Italian government bonds in the secondary market if need be. But investors, as ever, are demanding greater certainty. If the ECB hands over its bond-buying responsibilities to the EFSF, there will be concerns that the rescue fund is not big enough for the job, said Karen Ward with HSBC. Having the ECB act as a fully fledged lender of last resort, just as the US Federal Reserve did during the 2008 financial meltdown, is anathema to Germany, which fears it would reward feckless debtors and sow the seeds of inflation. But in dodging the question, euro zone leaders had squandered the chance to get ahead of the market, said Nicholas Spiro, managing director of Spiro Sovereign Strategy, a London consultancy. The country most at risk of contagion is Italy, where anaemic economic growth and faltering confidence in Prime Minister Silvio Berlusconi are compounding the difficulty of servicing a debt-to-GDP ratio of nearly 120 per cent. Under pressure from his euro zone partners, Berlusconi gave a raft of reform commitments at the summit, including raising the retirement age by two years, to 67, by 2026. Not only do such deep-seated policy shifts take years to have an economic impact, they are highly contentious politically. Postponing the retirement age is so fiercely opposed by Berlusconi’s ally the Northern League that it could topple his coalition government, Royal Bank of Scotland said. The deal to buy out its Swedish partner gives Sony ownership of certain handset patents held by Ericsson and will enable it to integrate the joint venture's output with its own range of products and content. "It's the beginning of something which I think is quite magical," said Sony's chairman and chief executive Sir Howard Stringer. "We can more rapidly and more widely offer consumers smartphones, laptops, tablets and televisions that seamlessly connect with one another and open up new worlds of online entertainment". Until now Sony's tablets, games and other consumer electronics devices have been kept separate from the phones sold and created by Sony Ericsson. "Sony is looking to do the same as Apple and meet user's demands through linking various devices with similar interfaces and operating systems," said analyst Nobuo Kurahashi of Mizuho Investors' Securities in Tokyo. "Since television sales are set to fall smartphones look to become more important products for Sony since their sales are rising globally and they will probably become the main device people use to connect to the Internet." Smartphone sales have been surging since Apple launched its first iPhone in 2007 and despite a slowdown in the overall consumer electronics market the strong demand for smartphones is expected to continue. Outstanding shares declined 5 percent from a year earlier to 222 million on September 30 as the company bought back stock. In the third quarter, Moody's repurchased 6.8 million shares after buying back none in the second quarter. The company affirmed its prior forecast for full-year earnings per share, but added that it expects final results to be "at the upper end" of the range of $2.38 to $2.48. Chief Executive Raymond McDaniel said in a statement the company affirmed the full-year forecast "though volatile market conditions in the US and Europe may continue." Corporate bond rating revenue was down 11 percent from the year-earlier quarter, the company said. Exxon Mobil’ profit rose by 41 per cent in the third quarter, helped by gains in crude oil prices and higher refining margins. Exxon, the world's largest publicly traded oil company, reported a profit of $10.33 billion, or $2.13 per share, up from $7.35 billion, or $1.44 per share a year earlier. Though part of the increase came from the reversal of temporary factors that had restrained growth, the expansion was a welcome relief for an economy that looked on the brink of recession just weeks ago. US gross domestic product expanded at a 2.5 percent annual rate in the third quarter, the Commerce Department said in its first estimate on Thursday. That was a big acceleration from the 1.3 percent pace in the April-June quarter and matched economists' expectations. "The probability of a double-dip has diminished quite a bit," said Sung Won Sohn, an economics professor at California State University in the Channel Islands. He made the comments before the release of the report. Consumer spending in the last quarter was the strongest since the fourth quarter of 2010, while business investment spending was the fastest in more than a year. Even though consumer spending was stronger, businesses were slow in stocking up their warehouses. The peppier spending and a slower pace of inventory accumulation by businesses will lay a base for a solid fourth quarter, but a slowdown in Europe and the exhaustion of pent-up US demand could leave a weak spot early in 2012. And the recovery's pace is still too weak to lower a jobless rate that has been stuck above 9 percent for five straight months. A jump in gasoline prices had weighed on consumer spending earlier in the year, and supply disruptions from Japan's earthquake had curbed auto production. Motor vehicle output has surged as those supply constraints have eased. In addition, car sales, which were held back by the lack of popular models, have also shown renewed strength. Gupta’s fall from grace has shocked observers of the corporate sector and financial markets who are scratching their heads to figure out as to what overbearing factor caused the man who had it all to throw it away and suffer the ignominy of being arrested on charges of insider trading. Says former mutual fund CEO, Krishnamurthy Vijayan, “It is difficult to understand the motivation of an eminent person who chooses to step outside the pale of accepted business practice without apparent financial gain”. It’s difficult to find a resume that gets bigger than this. Gupta was ex-managing director, McKinsey & Co, the foremost consulting company in the world which advises the largest companies in the world and in his current role where he is being charged was a director on the board of Goldman Sachs, the pre-eminent Wall Street firm known for its humungous profits and trading acumen. Says former SEBI chairman, DR Mehta, “It is an unfortunate development”. Gupta is being charged for insider trading and giving out Goldman’s confidential information to Raj Rajaratnam, a hedge fund manager. He also sat on the boards of other illustrious companies including an important position in the Indian School of Business (ISB). Gupta’s arrest and subsequent bail has evoked some very strong reactions citing betrayal of trust. Says Manoj K Raut, CEO, Institute of Directors, “Rajat Gupta happens to be the first executive from the upper echelons of corporate America to be implicated in the far-reaching scandal. But he betrayed that trust by disclosing their most sensitive and valuable secrets to the disadvantage of investors, shareholders and fellow directors”. Raut believes that Gupta used his position in an inappropriate manner. “Also, he became the illegal eyes and ears in the boardroom for his friend and business associate, Raj Rajaratnam, who reaped enormous profits from Gupta’s breach of duty”. Experts say that Gupta being charged has somewhat sullied brand India. “It has certainly not helped the image of India and Indians in the international community ", says Vijayan. It is ironical that US law enforcement had started bugging Rajaratnam on suspicion of money laundering for the LTTE. The insider trading scandal just happens to be a by-product of that surveillance exercise. Insider trading is an offence in stock markets when somebody who has access to confidential information that can influence stock prices uses or divulges it before it is made public. Says Mehta, “Insider trading is one of the most serious offences in the capital market. It is very difficult to detect as it is done underneath and that is the reason that very few cases of insider trading are detected in major jurisdictions around the world”. Raut says there is a lesson in the episode for Indian Inc. “Friends are friends and business is business. Mixing the two is fraught with danger. It is wise to keep your personal and professional lives apart”. Experts say that unnecessary greed may have proved to be Gupta’s nemesis. On Wall Street, where zeroes matter, watching others make more money can cause error of judgement. On top of that, the law enforcement in the US is so strict and effective that once you are caught, the law literally takes its own course. They are skeptical of Gupta’s defence that the information was being passed on for networking. Experts say that Gupta may trade favours with his equals but after a board meeting to immediately call Rajaratnam and give information may have been something else. Though results for the second quarter suggest "healthy state of affairs for Indian corporates, fears of global financial contagion pulling down growth in developing countries are mounting," it said. An analysis of the second quarter results of 87 companies across different sectors showed that even the domestic consumption is coming under the impact of high interest rates and increasing raw material costs. The Reserve Bank of India has followed a tight monetary policy since March 2010, raising interest rates by 375 basis points since then. Besides, fresh investments face delays in government clearances, the Assocham said. "There are some long-term concerns," which need to be addressed by the government,Assocham Secretary General D S Rawat said. He said the chamber found that while there were no visible signs yet, fall in business for the IT and ITeS to Europe and the United States," prices have fallen or remain unchanged". Food inflation, as measured by Wholesale Price Index (WPI), stood at 10.60 per cent in the previous week. The rate of price rise of food items was 14.20 per cent in the corresponding week of 2010. As per data released by the government today, vegetables became 25 per cent costlier, year-on-year basis. Similarly, Fruits grew dearer by 11.96 per cent, milk by 10.85 per cent and eggs, meat and fish by 12.82 per cent. Pulses also became dearer by 9.06 per cent and cereal prices were up 4.62 per cent year-on-year. However, onions became 18.93 cheaper. Wheat prices were also down 0.95, and potatoes by 0.45 per cent during the week under review. As for weekly comparison, inflation in the overall primary articles category was 11.75 per cent for the week ended October 15, compared to 11.18 per cent in the previous week. Primary articles have over 20 per cent weight in WPI. Inflation in non-food articles, including fibres, oil seeds and minerals, was recorded at 7.67 per cent during the week under review, as against 8.51 per cent in the week ended October 8. According to Forbes' annual India Rich List, the total wealth of the country's 100 richest has fallen to $241 billion, down by 20 per cent or an estimated $60 billion. The number of billionaires has also fallen by a dozen to 57 currently, Forbes said, while adding that falling stock and currency prices also led to diminishing of their wealth. Mukesh Ambani, head of Reliance Industries Group, has retained his position as the richest Indian with a networth of $22.6 billion, though his wealth declined by $4.4 billion in past one year. Forbes said that Mukesh's younger brother Anil Ambani saw the biggest erosion in his wealth in absolute terms, making him the biggest dollar loser. Anil Ambani's net worth declined by $7.4 billion to $5.9 billion and he "slipped out of the top 10 for the first time since his 2004 debut". He is ranked 13th in this year's list. Power producer Lanco Infratech's Madhusudan Raw was the biggest loser in percentage terms as his networth fell by 78 per cent during the past one year. 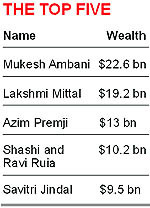 Mukesh Ambani is followed by steel tycoon Lakshmi Mittal and technology czar Azim Premji at second and third slots with networth of $19.2 billion and $13 billion, respectively. The new textile parks, to be set up under public-private- partnership, would attract an overall industry investment of over Rs 9,000 crore generating employment of four lakh workers, according to an official statement issued here. The scheme for the integrated textiles parks would be implemented within 36 months, it said, adding the government would finance common infrastructure with a subsidy of up to Rs 40 crore for each of the textiles enclaves. Six of these parks would come up in Maharashtra, four in Rajasthan, two each in Tamil Nadu and Andhra Pradesh, one each in Uttar Pradesh, Gujarat, Tripura, Himachal Pradesh, Karnataka, Jammu & Kashmir and West Bengal. Commerce and Industry Minister Anand Sharma, who also holds the additional charge of the Textiles Ministry, approved the sanctioning of the parks. "The sanction of new textiles parks would catalyse significant additional investments with industry utilising the benefits both under the scheme for integrated textiles parks and under the Technology Upgradation Funds Scheme (TUFS)," the statement said. The Department of Telecom (DoT) had imposed Rs 50 crore fine on the country's largest telecom operator for issuing SIM cards in bulk to two firms for distribution among foreigners and NRIs, allegedly violating security conditions in the licence agreement. As Bharti Airtel moved Telecom Disputes Settlement and Appellate Tribunal (TDSAT) early this month against the DoT order, the tribunal asked it to first pay half of the penalty for being heard. Bharti Airtel then approached the Delhi High Court, which too rejected its plea with the Bench of Justice Vipin Sanghi asking it to pursue the case before the tribunal itself. Bharti Airtel also contended that it had only issued SIM cards/connections in bulk, and it had already terminated the rental agreements or contracts for them 19 months before the demand of penalty by DoT. The tribunal's interim order had come on a petition by Bharti Airtel challenging the penalty demanded by DoT. The DoT had imposed the penalty on the telecom operator on September 19 after it found that the company had issued 1,847 bulk mobile connections to Falcon Business Resource Pvt Ltd and 741 to Galaxy Rent, violating the terms and conditions of its licence agreement. During the proceedings, DoT had submitted before the tribunal that by issuing SIM cards to the companies, which later transferred them to NRIs and foreigners, Airtel breached the security conditions of the licences.